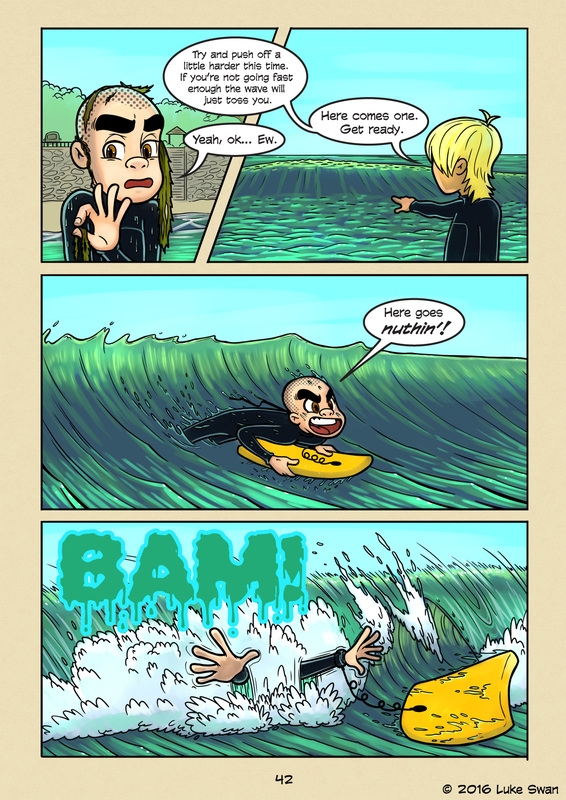 Try again (#042) | Web comic "Surfer Joe"
Or something like that. It’s the only way to learn and get good at something. You can research and study all you want, but without practice, you are just running on theory. To get good at something you have to have an intrinsic understanding of it. To develop that understanding requires earnest practice. This took me until my 30’s to figure out. That doesn’t mean I didn’t have my talents. But I didn’t understand what my mind and body were doing when practicing. I was just practicing over and over with little direction or objective. I mean, there was always objective. Make this or that comic, or make an animation. Get better. But what did “get better” mean? Was it to create a great piece of storytelling? I found this to be elusive. What is or isn’t great storytelling is in the eye of the beholder. Maybe it was my own personal definition of great storytelling, but I find I keep moving the bar on myself, and I’m never satisfied. But things started to change when I took up surfing. I became obsessed rather quickly. I watched tons of surf videos and read and watch instructional content on the internet. loaded up with knowledge I would then take it out to the beach and practice, practice, practice. There were days I would get so hyped up to practice I felt like I was going to erupt. I had never been so singularly focused on something. When I came out of the other end I understood what it takes to become proficient at something. I looked at my art that I had been creating the last 10 years and realized how easy it had gotten for me to create. And I could see the barriers I had put up that were making things artificially difficult for me. Surfing taught me how to learn and how to focus. “Once you understand the way broadly, you can see it in all things” -Miyamoto Musashi, The Book of Five Rings. This is one of my favorite quotes. It is so simple but carries so much power. It means, at least to me, that once you understand the way of learning, you can teach yourself anything. We are only limited by our own self-doubt. I feel if this is the point of school, but it is up to the student to understand this fundamental truth, and it is up to the teacher to help the student see it.